Predict thermodynamic properties of solutions. Screen solvents for desired logP, VLE, LLE. A database of over 2500 compounds (solvents, small molecules, ionic liquids) facilitates instantaneous predictions of log P, solubilities, and other properties. It is easy to add other molecules to the database with a prescribed ADF calculation and quick estimation tools. Tutorials show step-by-step how to set up COSMO-RS property calculations with the GUI. Scripting tools enable rapid solvent screening, e.g. to find the solvent combination which best partitions a drug and its main contaminant, or to determine the best excipients. 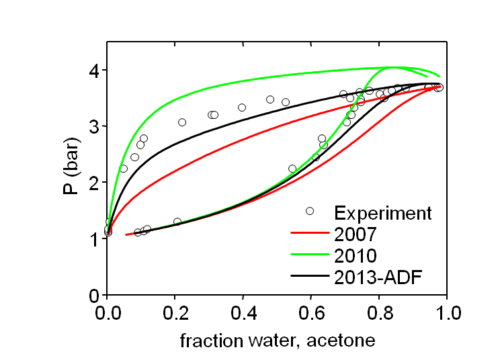 We also offer the COSMO-SAC (segmented activity coefficients) model. The recent reparametrization of COSMO-SAC by Stan Sandler’s group improves partition coefficients (logP) for a set of solvent combinations. Furthermore, vapor-liquid equilibrium predictions are improved yielding a better agreement between calculated and experimental vapor pressures of mixtures. Even higher accuracy may be achieved by including 3D contact information (COSMO-SAC-3D) as well as including pure solvent data (e.g. DIPPR). Chemical engineers may want to optimize distillation processes by tweaking vapor pressures and boiling points, while medicinal chemists perhaps want maximize solvent extraction efficiency to separate the active pharmaceutical ingredient from its main contaminant, or maximize solubility with excipients. Our solvent system optimization tool is perfectly placed to help reduce the experimental search space by optimizing solvent mixtures for solubility or liquid-liquid extraction across a set of selected solvents. This tool will be expanded to other solvent optimization problems. In the meantime the included scripting tools enable easy screening of solvents and solvent combinations for particular properties. Applications for scripting with COSMO-RS/SAC include optimizing catalysts, solubility parameters, pKa values and sorption in ionic liquids. The SCM team is eager to hear about how our software can be used to tackle your solvent optimization challenge. Do let us know if you have any requests for new solvent optimization templates! Very quick estimators are available in our 2018 release. 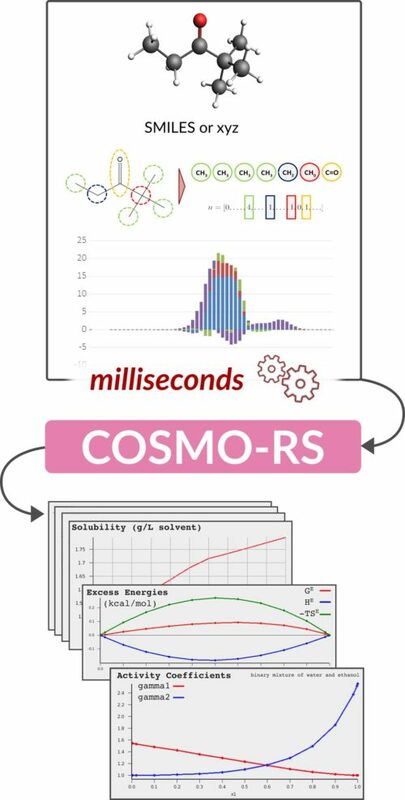 Sigma profiles, volumes, and areas are instantaneously predicted from SMILES strings or an xyz file, which can then be used in COSMO-RS or COSMO-SAC thermodynamic property predictions. The group-contribution based UNIFAC activity coefficient method has also been added, which offers very fast and accurate predictions for many thermodynamic properties within its parameterization scope. In 2018, we have also implemented instantaneous QSPR predictors for a range of different physical properties such as heat of melting, boiling point, flash point, critical temperature, etc.